March 27, 2019 4:07 am. LAS VEGAS, Nevada – LFA CEO Ed Soares announced today that the promotion will return to the resort town of Vail, Colorado to kick off Cinco de Mayo weekend. The main event of LFA 65 will feature a high-stakes flyweight showdown between two of the promotion’s biggest stars. In 2017, RFA and Legacy FC merged to form LFA, the premier developmental organization in Mixed Martial Arts. The combined forces of LFA launched the careers of over 150 athletes that have reached the pinnacle of MMA by competing in the UFC. In May 2018, the promotion joined the London Trust Media Holdings group of companies. 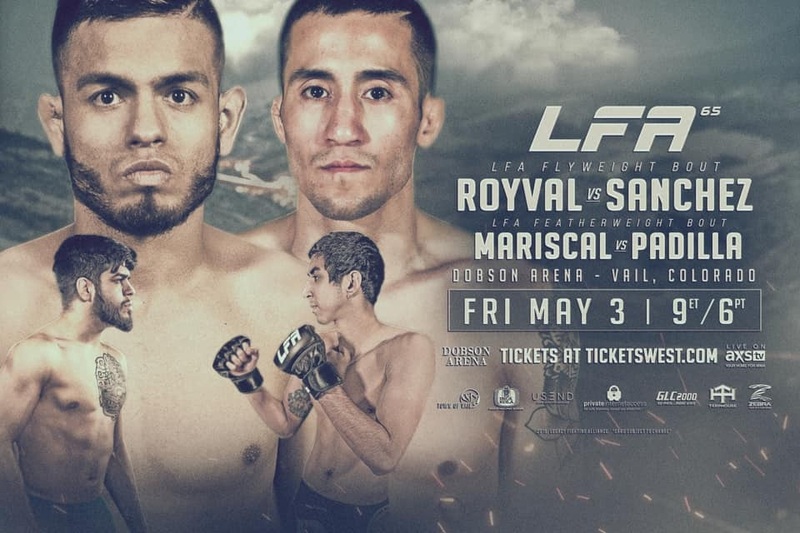 LFA 65 will be the second LFA event to take place in the Colorado resort town of Vail. It will also be the sixth time that LFA has traveled to the state of Colorado. RFA visited “The Centennial State” eight times before the merger. The entire main card of LFA 65 will be televised live and nationwide on AXS TV at 9 p.m. ET / 6 p.m. PT. Please visit LFA.com for bout updates and information. LFA is on Facebook at Legacy Fighting Alliance. LFA is also on Instagram at @LFAfighting and Twitter at @LFAfighting. LFA is a professional Mixed Martial Arts promotion that gives rising stars and top contenders the opportunity to prove their talent to fans and leaders in the industry. LFA was formed by the powerhouse merger between RFA and Legacy FC. LFA presents live Mixed Martial Arts events on a monthly basis around the United States including Las Vegas, Los Angeles, Denver, Dallas, and Houston. LFA can be seen live in over 53 million homes nationally through its television deal with AXS TV. Based in Las Vegas, NV, LFA is one of the most active and respected MMA organizations in the fastest growing sport in the world. (The Octagon, Ultimate Fighting Championship®, UFC®, and the eight-sided competition mat and cage design are registered trademarks owned exclusively by Zuffa, LLC. All rights reserved). London Trust Media is a diversified business focused on the Internet and media industries – bringing the Internet back to its original state and bringing power back to the people. London Trust Media runs the leading no-log VPN service provider in the world Private Internet Access (PIA) as well as Kore Asian Media, Linux Journal, freenode, Snoonet, JOG, BlockExplorer, and Provocateur. Please visit their website at www.londontrustmedia.com for more information. Since its incorporation in 1966, Vail has earned the distinction as one of the leading mountain resort communities in North America. With more open space than any other community of its kind, free transit and other environmentally-sensitive services, plus an abundance of recreational, cultural and educational opportunities, Vail has become not only a great place to visit, but an even better place to live. Please visit their website at www.vailgov.com for more information.